Making pasta is, for me, therapeutic. There is a zen in noodle-making that I am certain Asian noodle makers understand, and it definitely translates into Italian pasta. Good pasta requires an outside awareness of what is not obvious: A feeling about whether there is too much water in the dough or not enough, an inkling that the dough has been kneaded enough. And then there is the endless repetition of making the shapes, especially handmade ones like tortelli. You soon find yourself in another place, and you can occasionally look back from the astral plane to see your hands automatically making gnocchi, or little hats, or ear-shaped bits or whatever. None of this applies to making pasta with a chitarra, however. 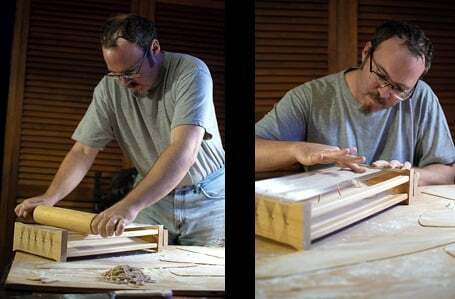 A chitarra is an odd wooden contraption we think originated in Abruzzi, in central Italy on the Adriatic side of the peninsula. Meaning ‘guitar,’ a chitarra looks like a double-sided harp, with strings set close on one side, farther on the other. In then center of the device is a slanted board, designed to allow the cut pasta to slide off easily once it’s been cut by the strings. I’ve never been too sure about why a chitarra was exactly necessary. The wide side is basically tagliatelle, which are easily cut by hand. The narrower side makes more sense because hand-cut spaghetti are trickier. I decided I’d go for that instead of harp-cut tagliatelle. 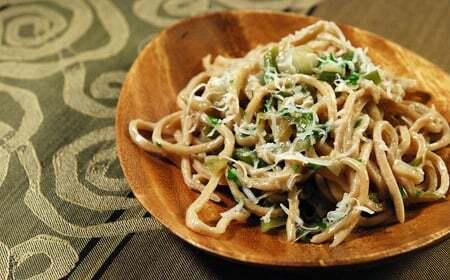 I began reading about chitarra, and, best I can tell, no one can really determine how thick the noodles ought to be. The Encyclopedia of Pasta says roll the dough out “not too thin,” and that ‘s about the best advice I can give: Pasta alla chitarra is not delicate, except for a rare version where the wires are spaced so thin they make angel hair pasta. I decided to make a square spaghetti, which meant rolling out the dough to No. 3 on my Atlas machine — pretty thick. As for the chitarra itself, you can buy one from Sur la Table, or buy a chitarra attachment for your Atlas. Gotta say though, “playing the chitarra” was way more fun than cranking a machine handle. When you dislodge the pasta from the machine, you literally play the strings, and the vibration knocks the noodles onto the slanted board. Dust them with plenty of flour immediately so they don’t stick together. What dough to use? Well, as some of you know, I am a huge fan of alternate flours: whole wheat, chestnut, rye, barley, spelt, even chickpea and acorn. I love the flavor of farro, also known as emmer: It is the oldest known variety of cultivated wheat, and eating it — whole like a risotto, or ground into flour — makes you understand why, 10,000 years ago, humans decided to settle down and try to grow more of this amazing stuff. 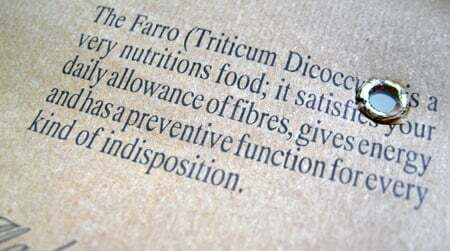 Farro is to typical whole wheat flour what supermarket baloney is to real mortadella. Gotta love Ital-ish. Almost as good as Engrish. Doughs are idiosyncratic. The use of eggs is always optional, but they add strength and flavor and, if you’re using yolks, color. I like the coffee-with-cream look of a straight farro pasta, but I had the whites of several duck eggs lying around (I used the yolks to make my oregano ice cream for an upcoming dinner party). So I used them in the pasta dough. I like the idea, but the dough turned out too wet, so I ended up adding a fair bit of regular flour as I kneaded the dough — for a full 10 minutes, as farro is a tough grain. I let it set for two hours so the farro could absorb all the liquid, and went to work. I had originally planned to serve this farro spaghetti alla chitarra with a puree of cardoons stewed with leeks, but the cardoons turn to water when I tried, so I left them out and just used the leeks. Worked for me, and made a great winter-into-spring dish — a little hearty, a little sprightly. Here is the recipe for the stewed leek pasta sauce, which has parsley and a little honey and anchovies (trust me, it works!). Maybe I was overstating it a bit when I said making pasta with a chitarra lacks the calming power of making other kinds. That’s not true. I felt better making something with my hands. And honestly, playing crazy anarchist harp player while strumming the chitarra made Holly and I both laugh. A lot. And laughter is what I need right now. This is a general recipe for the brown wheat flours: whole wheat, spelt or farro — the last two are older varieties of wheat that can be found in a health food store. The point of this kind of pasta is to be rustic and earthy: Bigger shapes, thicker ribbons, chunkier sauces and heartier accompaniments. Whisk together the egg whites, water and olive oil and pour into the well. Mix together by hand, and when the dough comes together begin kneading — if you suspect the dough may be too dry, add a smidge of water. Use extra flour if it is too wet. Knead for a good 8 to 10 minutes. Wrap in plastic and set aside to rest for 1 hour, or up to 24 hours in the fridge. Roll out pasta to whatever shape you want. Farro is the best of the three choices here, as it is just the essence of wheat — a lovely aroma and pretty coffee-and-cream color. Spelt is nearly as good, but is slightly more metallic-tasting. Whole wheat flour is the fall-back, although freshly ground whole wheat flour is excellent.